The Western New York Consortium of Higher Education, with funding from The John R. Oishei Foundation, commissioned the UB Regional Institute to assess the role of higher education in advancing the region’s knowledge economy, based on the premise that the industry is a major but underutilized economic driver. 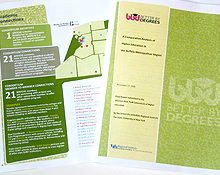 Working in partnership with 22 major colleges and universities in the region, the institute developed several reports assessing the industry’s capacity to meet regional workforce needs, the industry’s overall economic impact, the nature of higher education collaboration in the region, and peer-region strategies to leverage higher education for economic growth. Now branded as WNY College Connection, the consortium effort aims to attract students to the region, engage students as part of the community, and retain them after graduation to strengthen the region’s workforce. In support of this mission, the institute developed a prototype web site, as a central resource for students featuring detailed college profiles and a dynamic tool to search for degree programs and colleges in the region. With a second round of support from The John R. Oishei Foundation, the consortium launched the WNY College Connection website and will continue to expand its program through 2012. The consortium’s Executive Director is working to implement strategies developed to advance its attract-engage-retain mission, including collaborative initiatives across the consortium’s 21 member institutions and partnerships between the higher education sector and relevant community stakeholders. The institute will remain engaged to provide research support as needed by the consortium. How well equipped are college graduates with the skill sets they need to fill jobs in our region? Working with the WNY Higher Education Consortium, the UB Regional Institute is conducting analysis of the skills employers look for in college graduates. Nearly all of the entry-level jobs we looked at across generally growing industries require mid to high performance levels of four basic skills. 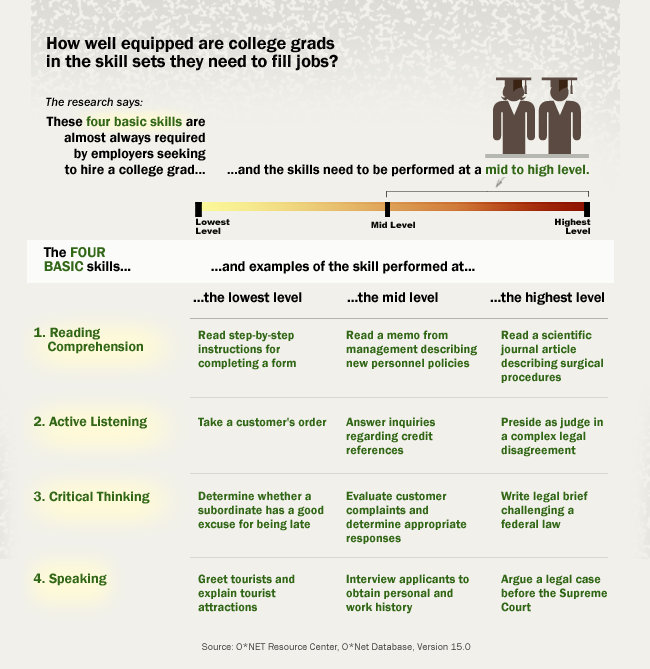 Another goal of this study is to determine what skills employers report as commonly missing in college graduates and identify ways higher education can more closely work with employers to ensure graduates have the skills employers need.